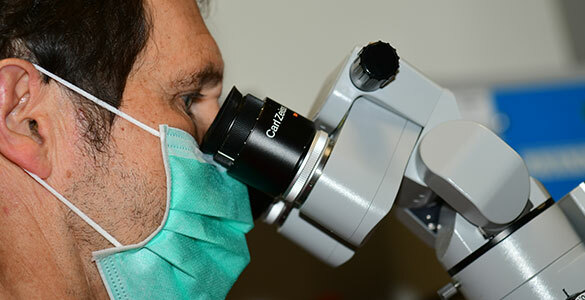 Dental Lasers are very useful in optimizing certain periodontal procedures which improves the outcomes and makes the procedures more effective. Dr. Zimmer uses the Elexxion Nano Laser which is an advanced diode laser. Diode lasers destroy bacteria and thereby disinfect the pockets and have the special feature of stimulating tissue healing and bone regeneration. This helps intra-oral wounds to heal quicker and bone to rebuild. Employing the diode laser with the additional use of photothermal therapy with perio green® can remove the need for antibiotics. Lasers assisted debridement of implants is used in the management of peri-implantitis which is a condition associated with bone loss around the dental implants. Many different issues can occur with the oral tissues, the majority of which are completely harmless. There can be redness, white patches, swelling, painful sores, an itching or burning sensation and others. If you have an oral condition requiring treatment or if you are worried about any unusual change in your oral tissues, contact our specialized periodontal practice in Munich to arrange an appointment with Dr. Zimmer.